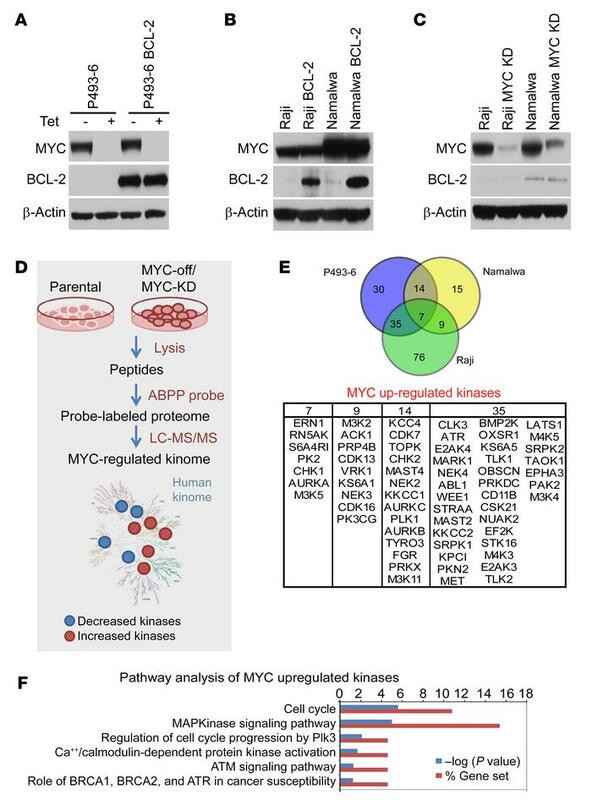 (A) Generation of isogenic BCL-2–expressing (MYC Tet-repressible) P493-6 B lymphoma cells. (B) Generation of isogenic BCL-2–expressing Raji and Namalwa BL cells. (C) Generation of isogenic CRISPR/cas9-mediated MYC KO/KD derivatives of Raji and Namalwa BL cells. (D) Schematic work flow of ABPP studies. (E) Overlap of kinases whose activity is upregulated by MYC in P493-6, Namalwa, and Raji BL cells (upper panel) and list of MYC-upregulated kinases (lower panel). (F) KEGG pathway analysis of MYC-upregulated kinome in models of DHL. See complete unedited blots in the supplemental material.